The newer revision history interface in Google Documents is now also available in Spreadsheets. You can now see all of the changes that collaborators have made cell-by-cell. – To see the new interface, go to ‘File’, then ‘See revision history’ when editing a spreadsheet. – Click on a time stamp in the right column to see what changes were made at a given time or use the arrow keys to quickly scan through many revisions. – Changes are color-coded based on each collaborator, making it easy to tell what has been added or deleted. – Time stamps are also improved in the new interface. – The interface also batches revisions into groups of changes to make it easier to understand how a spreadsheet has changed over time. To see a finer-grained list of revisions, click ‘Show more detailed revisions’. Google Spreadsheets has a new editor for charts. 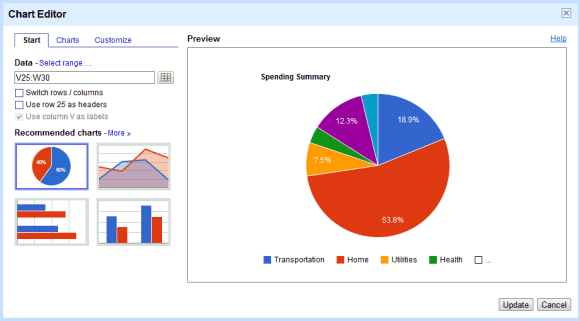 The editor recommends charts, lets you select colors and has a bigger preview pane. Charts look much better and you can now add timelines, organizational charts, gauges, and motion charts without using gadgets. Here are some of the new charts. Now that we have a new version of charts, you may be wondering what will happen to your old charts. You’ll be able to edit your old charts for a short time, but you’ll be able to create charts using the new version only. In the long term, you can keep your old charts as view-only or you can upgrade your charts to be able to edit them. When you upgrade, your data and chart type will remain the same, but the look and feel of your chart will be improved. That’s cumbersome and completely unnecessary. You can’t select multiple delimiters, exclude certain columns or pick the data format before importing the file. These features are available in Microsoft Excel and, even though some them aren’t necessary, they make it easier to properly import the data you need. Google have introduced in-cell dropdown and validation to spreadsheets. 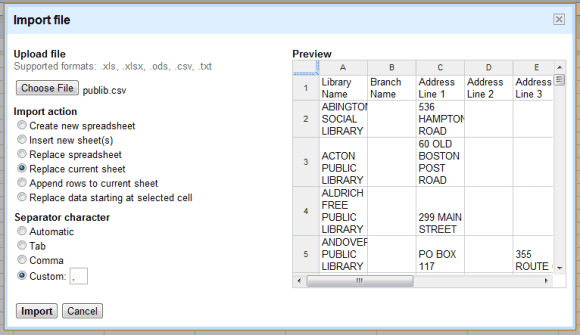 This makes it easy to constrain the values of an individual cell to a specific range or list. 1. Enter data into a range of cells. For example, create a list of destinations on your spreadsheet. 2. Select the cell(s) you would like to validate. 5. Click the button next to the ‘Create list from range’ option and select the range of cells you entered data in during Step 1. 6. Click Save and the cell you chose to validate will have a dropdown arrow in it with the data in your cell range as the potential input values. If you want, you can set a cell to allow invalid data. Google Spreadsheets added a feature that lets you copy the formatting a cell and use it for other cells. It’s called “format painter”, like the similar feature from Microsoft Office. To use the format painter, select a cell that has special formatting, click on the “paint format” button from the toolbar and then select one or more cell to apply the formatting. 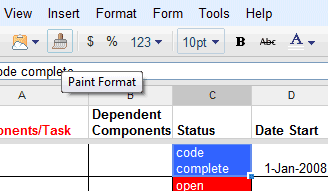 Unfortunately, format painter is not available in all Google Docs applications and you can only use it in Google Spreadsheets. So much for the Google Docs consistency. – Format painter allows you to apply the same formatting to other elements more easily. – GoogleLookup function attempts to find the values for straightforward facts about specific things. – The creator of the form needs to enable the new checkbox ‘Allow users to edit responses’ to allow respondents to edit their responses after they’ve submitted the form. – If your username is being collected by the form and you check the ‘Send me a copy of my responses’ option, then there will be a link to change your responses in the confirmation email that you receive. – You can also edit your responses on the form submission confirmation page. On the confirmation page, click the ‘Edit your response’ link.